Scandium alloy tubing throughout, fully tig welded. 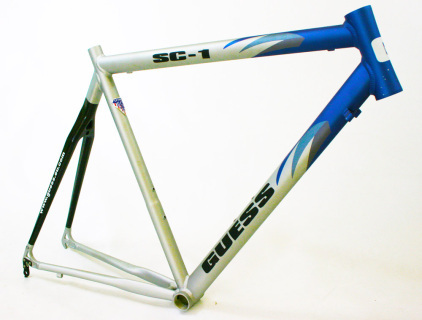 Suitable for integrated Cane creek or Guess a-headset.. Accepts standard allen key sunk in brake nut. Accepts a 27.2 mm seat post. Requires a bolt on front derailleur hanger. Available for £9 extra. Comes complete with alloy seat tube clamp. Weight - 1.119 Kilograms (Approx.2.46 lbs.) on 57cms. Including hanger. Weight - 1.152 Kilograms (Approx.2.53 lbs.) on 60cms. Including hanger. Superb quality, award winning ultra lightweight road frame ideal for Triathlon, Time Trial or Road Racing. Check out the Guess super smooth integrated sealed bearing headset and the Guess alloy front derailleur bracket. See why everybody raves about this incredible value frame. Just because its ultra lightweight scandium tubing you dont have to break the bank. PRICE INCLUDES UK POST & PACKING (EXCLUDING SCOTTISH HIGHLANDS AND ISLANDS, NORTHERN IRELAND, ISLE OF MAN AND SCILLY ISLES.